Warm pitas stuffed with your favorite sweet and cheesy combination! Cut pita pockets in half. Spread about 1 teaspoon spicy mustard inside each pocket. On cutting board, layer 1 slice ham, 1 slice Provolone cheese and 1 slice ham together. 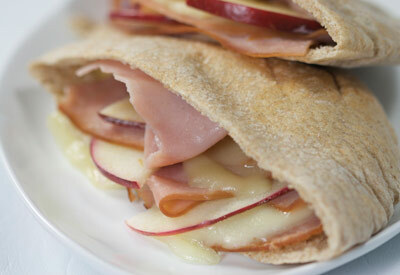 Fold in half, tucking 3 or 4 slices of apple between the ham and cheese halves. Tuck the layers into the pita pocket half. Microwave each pocket on high for 30 seconds or until cheese begins to melt. Let stand a few minutes before eating. *Heating pita pockets in the microwave for a few seconds may soften them slightly to make this process easier.